The system includes a ram assembly with fingers for grasping a fastener. An actuator moves the ram assembly toward the workpiece, under machine control. A housing member which is movable by the actuator includes a holding member for an anvil portion of the ram assembly, the holding member being movable within the housing member. The holding member and the housing member are arranged so there is a selected air gap between the movable member and the top of the housing at the start of the fastener cycle. An insertion sensor assembly changes signal state when the air gap begins to close. When the air gap begins to close either too early or too late relative to a properly positioned fastener, the actuator is stopped by the cycle motion controller. The magnetic base assembly includes an electromagnet assembly with a top surface open magnetic pole. A shunt plate is magnetically held to the top of the electromagnet. A canting or tilting of the shunt plate results when accidental side or pulling away contact is made between a riveting processing tool and an extending portion of the aircraft part being riveted as the tool is moved from one riveting location to another. The canting or pull off of the tool prevents damage. The operator can observe the tool canting and stop the tool movement or a micro switch or proximity switch senses the canting or tilting automatically so that the tool can be stopped before damage occurs. The magnetic field can be dynamically controlled to provide adequate pulldown force for the riveting function but a breakaway force less than the amount which would cause damage. 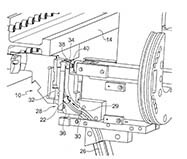 A machine includes a feed system for moving fasteners to a track-type fastener injector system and a pusher for moving the fasteners along the track. A rivet ejector assembly comprises a pair of bomb bay-type doors which support a portion of the track feed system and a mechanism for recognizing misfed rivets as they approach the bomb bay doors. 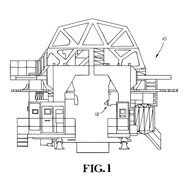 The bomb bay doors are rotated about their longitudinal axes so that opposing inner surfaces of the bomb bay doors pivot away from each other, along with the track portion, permitting the fastener to fall or be blown therethrough, ejected from the injector system. A robot mechanism for controlling the position of a machine tool in a large-scale manufacturing assembly includes six rotary axes and one linear axis. Secondary feedback systems are included on at least several of the axes. A controller receives secondary feedback information and uses it to control the position of the machine tool within an accuracy of ±0.3mm. 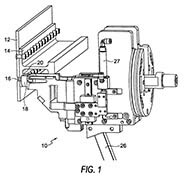 The system includes a moving feed assembly, including a feed channel, through which a collar is moved by compressed air to a position in substantial alignment with the centerline of a swaging die tool. There is sufficient clearance between the collar and the channel to permit movement of the collar as a forward end of a die pin portion of the swaging die tool moves and engages a center opening of the collar. 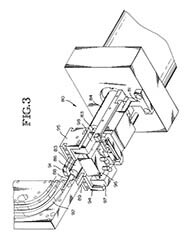 Collars having a center opening are conveyed through a feed channel by compressed air to a swaging die tool for bolts. 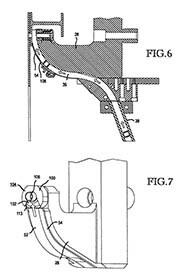 There is sufficient clearance between the collar and the channel to permit movement of the collar as the forward end of the die pin engages a central opening of the collar, the feed assembly or the swaging die tool being moveable sufficiently thereafter to permit a die-pin engaged collar to move forward for engagement with a tail end of a bolt. The collar is loaded onto the bolt and the collar moved forward to a stackup of parts prior to a bolt being moved through an opening in the stackup for engagement with the collar. 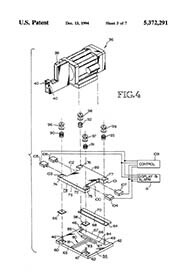 The system includes a moving feed assembly through which a collar is moved by compressed air to a position in substantial alignment with the centerline of a swaging die assembly. 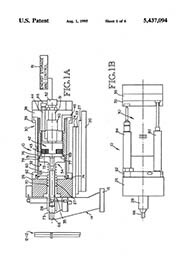 Two spring-loaded fingers are mounted on opposing sides of the feed assembly for receiving the collar by compressed air action where it is maintained in substantial alignment with the swaging die assembly. The spring action of the fingers is strong enough that the collar can be pressed firmly against a curved receiving portion of the fingers by the compressed air. A die pin portion of the swaging die is then inserted into the collar, thereafter maintaining the position of the collar as the feed assembly with the opposing fingers are stripped away from the collar, leaving the die pin-engaged collar free to be moved by action of a ram assembly to a stackup of parts to be fastened, where the collar can be transferred onto a bolt which extends through the stackup. 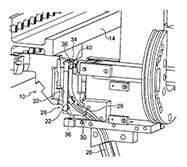 The system includes a collar feed assembly which includes a channel within a step assembly at the end thereof, which defines a receiving cavity for the collar. The receiving cavity is configured so that the collar can move slightly therein, permitting a die portion of a die tool to engage a center opening of the collar, so that the collar can come into accurate alignment with the center axis of the die tool. The die tool is mounted to be movable slightly transversely to permit a reliable transfer of the collar onto the bolt. The collar is more compliant than the die tool during loading of the collar onto the die pin and the die tool is more compliant than the collar during transfer of the collar from the die pin onto the bolt. A system and method for feeding collar members to an attachment system for assembly of aircraft and similar large scale mechanical assemblies. Collars are fed sideways along a tube having a rectangular internal cross-section to a collar pathway defined by a clamp fork and swaging ram combination. 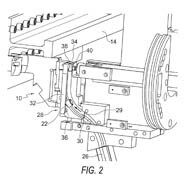 The collar pathway is curved to present the collar to a receiving element mounted on a swaging die in a proper orientation relative to an attachment bolt which is moved through an opening in the workpiece and then through the collar. As the bolt is moved into the collar, the collar, receiving element and swaging die move together laterally to come into alignment with the bolt. 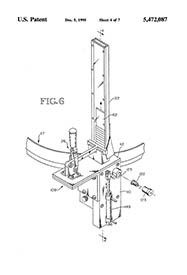 The apparatus and method includes a spindle portion which holds a cutting tool. The drill is initially moved forwardly of a pressure foot portion of the apparatus. 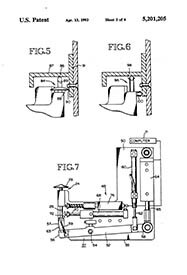 The pressure foot portion is then moved forwardly along with the spindle and drill to clamp the mechanical assembly. A thrust control arrangement produces a reduction of the thrust on the tool holder such that as the assembly is being clamped, the tool initially contacts the workpiece and then remains stationary while the pressure foot moves forward to complete clamp­ up. The positions of the tip of the tool and the surface of the workpiece are recorded and compensation is then made to the apex position of the spindle stroke, using a previously determined reference position of the tool relative to the workpiece. The system includes means for moving a rivet or a collar from a storage bin to an initial position for the respective gripping assemblies. The presence of the rivet and/or collar is recognized as it moves through a feeding mechanism. After the rivet or collar is gripped, they are moved either into an opening in the workpiece, in the case of a rivet, or onto the tail of a lockbolt, in the case of a collar. The gripping assembly is then released from the rivet or the collar, with the gripping means moving back to an initial position. Further operations can then be carried out on the rivet or collar. The power supply, useful with an electromagnetic force apparatus such as a riveter or a bolt inserter, includes two capacitor banks which are charged through charging doubler modules. Each charging doubler module includes an AC capacitor which is responsive to a power source. The AC capacitor is connected to a node point between two diode elements, which are connected in series across the capacitor bank. An analog-to-digital converter converts the voltage on the capacitor bank to a digital voltage for comparison with a selected digital charge voltage in a controller. The selected digital charge voltage may vary over time by means of a compensating algorithm. A ground fault indicator using a biasing voltage is connected between a selected electrical circuit portion of the force apparatus and earth ground. A gas discharge tube in combination with a current sensing element is connected to the capacitor banks to determine a possible over-voltage condition. 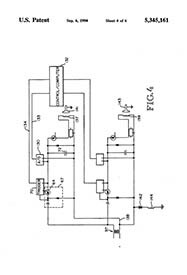 A Hall-effect sensor is mounted between bus connections which carry the current between the capacitor bank and a coil portion of the electromagnetic force apparatus to determine the current flowing into the coil by measurement of the magnetic field between the bus bars. A rivet feed system which includes a base feeder assembly, having a rivet passageway extending lengthwise therethrough. The base feeder assembly includes cutout regions to receive rivet injectors which are moved in operation between a first position and a second position. 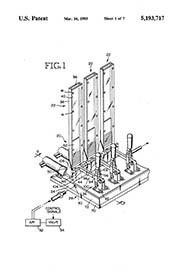 In the first position, an opening in the injectors forms a part of the passageway through the base feeder assembly, while in the second position, the opening is positioned directly beneath a vertically oriented rivet cartridge to receive a rivet therefrom. The passageway is connected to a source of pressurized air which moves rivets therealong to a rivet machine or the like. 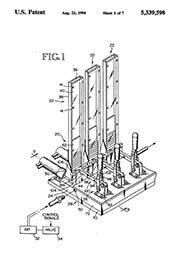 The plurality of cartridges positioned along the base feeder assembly contain rivets of various selected sizes. The rivet cartridges are filled off line by means of a vibrating bowl feeder and a rivet insertion assembly which includes a rivet pump which automatically and repetitively moves rivets which have been inserted thereinto from the bowl feeder into the rivet cartridge. A collar-swaging die includes two portions which are slidable relative to each other for alignment of the collar onto the exposed end of the bolt. A base assembly for use with a riveting apparatus such as an electromagnetic riveter (EMR). In one aspect of the invention, the base assembly includes a base plate having a raised beveled portion extending upwardly from the upper surface of the base plate. A mounting plate fits on and is secured to the base plate by a plurality of coil springs. The mounting plate has a recessed portion in the lower surface thereof which mates with the raised portion of the base plate. Trip switches are positioned in the mounting plate for detection of movement of the mounting plate relative to the base plate in response to undesired contact between the EMR and a part assembly or fixture therefor. An output signal indication is provided when one or more of the trip switches are actuated. In another aspect of the invention, a base assembly mounting plate is mounted on mounting studs and locating pins which extend upwardly from a base member. An EMR is mounted on the mounting plate. Spring washers are located between the mounting plate and the base member. The washers are configured to permit a selected amount of preload compression by locking nuts operating on the mounting studs while still permitting a selected range of movement for height adjustment by turning the locking nuts in one direction. The power supply, useful with an electromagnetic force apparatus such as a riveter or a bolt inserter, includes two capacitor banks which are charged through charging doubler modules. Each charging doubler module includes an AC capacitor which is responsive to a power source. The AC capacitor is connected to a node point between two diode elements, which are connected in series across the capacitor bank. An analog-to­digital converter converts the voltage on the capacitor bank to a digital voltage for comparison with a selected digital charge voltage in a controller. The selected digital charge voltage may vary over time by means of a compensating algorithm. A ground fault indicator using a biasing voltage is connected between a selected electrical circuit portion of the force apparatus and earth ground. A gas discharge tube in combination with a current sensing element is connected to the capacitor banks to determine a possible overvoltage condition. 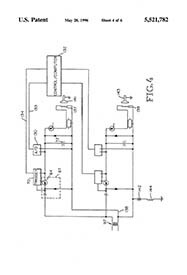 A Hall-effect sensor is mounted between bus connections which carry the current between the capacitor bank and a coil portion of the electromagnetic force apparatus to determine the current flowing into the coil by measurement of the magnetic field between the bus bars. 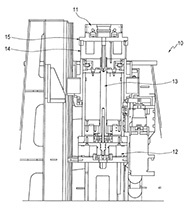 The bolt insertion apparatus includes a driver which is partially contained within an interior volume defined by an inner cylindrical sleeve which is secured at its front end to a forward mass portion of the apparatus. An actuator coil is also positioned within the interior volume for electromagnetic actuation of the driver. An outer cylindrical sleeve includes a recoil mass at the rear end thereof, with the coil extending forwardly from the recoil mass into the interior volume of the inner sleeve. The outer sleeve is movable longitudinally relative to the inner sleeve. A spacer element is selectively removable between a forward end of the apparatus and a clamp-up nosepiece member. The apparatus is initially positioned such that there is a gap between a tool on the end of the driver and the head of the bolt. The collar-swaging apparatus includes a driver element mounted for longitudinal movement. 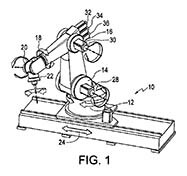 A collar transfer arm is mounted for rotational movement into and out of the longitudinal axis of movement of the driver, for insertion of a collar onto a die which is attached to the driver. A collar-swaging -die includes two portions which are slidable relative to each other for alignment of the collar onto the exposed end of the bolt. 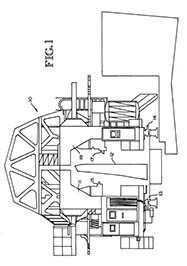 A collar­ swaging apparatus includes an inner sleeve and an outer sleeve which are arranged relative to each other so that recoil of the recoil mass, with corresponding movement of the inner sleeve and a hard stop element, results in contact between the hard stop and the driver, and subsequent rearward movement of the driver results in the removal of swaging tool from the collar. 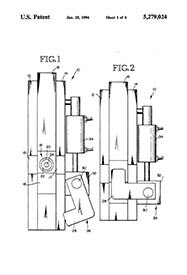 The apparatus includes a riveting assembly which includes a rivet die having a concave configuration which is brought into contact with one end of a rivet to be upset. The die is driven into a rivet end by a rivet ram a first time, resulting in an interference fit between the rivet shank and the part being riveted. When the die is withdrawn, the newly formed rivet head will in some instances expand outwardly away from the surface of the part, leaving a gap between the formed end of the rivet and the part. A second strike assembly includes an L-shaped second strike element which is moved between the die and the rivet head. The ram is then driven a second time, forcing the second strike element against the formed end of the rivet, forcing the formed end of the rivet to flow outwardly and toward the part, resulting in the filling of the gap between the rivet head and the surface of the part. A two axis tracer includes a back plate and a front plate assembly which includes a single sensing member at the top end of which is a mushroom­ shaped cap portion. Mounted on back plate is a slider assembly which moves in one direction between the front and rear edges of the back plate. The front plate assembly is mounted to the slider assembly. A first air cylinder operating a lever arm provides movement of the sensing member in the other direction, which is perpendicular to the one direction. 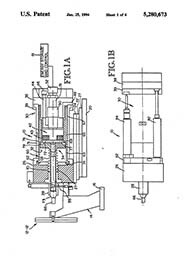 A second air cylinder includes an extendable rod, the end of which is secured to the back plate, providing movement of the front plate assembly by action of the slider assembly. The top and peripheral edge of the cap portion contact surfaces of the part to be worked in the two directions. The deicing system includes a plurality of relatively thin, flat coils positioned between an aircraft surface and an outer sheet. If the aircraft surface is electrically conduction such as aluminum, such that eddy currents may be established therein, then the outer sheet is resistant to eddy currents being established therein. 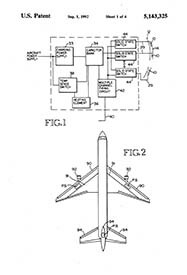 An electrically conduction layer may be positioned between the coil and the aircraft surface to improve efficiency. If the aircraft surface is resistant to eddy currents being established therein, then outer sheet is electrically conduction. However, if an electrically conducting layer is positioned between coil and outer sheet, the outer sheet may be made from non-conduction material. A rapidly rising current through the coil will result in a rapid repulsion between the coil and the particular member which is electrically conducting, causing ice to be removed (shattered) from the outer sheet.